Joe Esposito (born January 22, 1938-November 23,2016) was a veteran author and publisher, who along with his long-time business partner Daniel Lombardy, have several best selling books to their credit. Esposito is best known for his association with Elvis Presley. He first met Presley while serving in the military in 1958. They both went through basic training at Fort Hood, Texas, but did not meet face to face until a year later when they were both stationed in West Germany, where they quickly became lifelong friends. 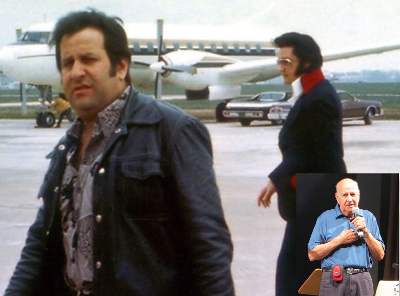 Esposito became Elvis's road manager and bodyguard beginning in 1960. Esposito served as co-best man, with Marty Lacker at Elvis's wedding while Esposito's wife, Joan, served as the matron of honor. After Elvis' death in 1977 Esposito went to work for Jerry Weintraub becoming the road manager for greats including Michael Jackson, The Bee Gees, Karen Carpenter and John Denver. Esposito has 3 children, Debbie (born 1962) and Cindy (born 1966) from his first marriage to Joan (Roberts) and Anthony (born 1985) from his second marriage to Martha Gallub. Martha Gallub Esposito died on March 19, 2012, after a long fight with cancer. Joe died November 23, 2016 after a year of declining health. When Elvis was alive you always heard about Joe and the boys . 78 years , a good life , thanks for sharing your memories with us about Elvis , goodbye . One of the few with any integrity. A pity Elvis didn't surround himself with more men like Joe. May he rest in peace. He adored Elvis.